Hi, my name is Tillie and i am a 5 – 6 year old pug. I was found a stray off of 156 and Maple here in Omaha, thank goodness someone found me because I am sweet, loving and oh so kind! I love to sit with you on the couch or lay with you in bed. I just like to hang out with you. I do snore a little bit, so I hope you don’t mind! I love to follow you back and forth wherever you go, because I am such a great companion. I get along great with other dogs, and children aren’t a problem for me (and neither are cats). I like to walk outside with my brother Hutch and my sister Lily (I am able to be walked on a leesh and i am potty trained). I am also kennel trained! If you think you have room for me at your house, I would love to find my forever home with you! Thanks alot! 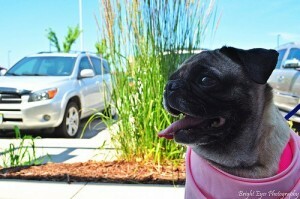 -Update on Tillie she is deaf and does need drops for dry eye but most pugs do. Tillie and I are doing great. She is training me and I am training her. Smile. I kept her name since she is deaf and it doesn’t matter anyway. The grandkids like it, so that is that. She likes to be in the back yard, but always wants me to be with her. I cannot imagine how limited her world is without hearing and one eye that is for all practical purposes blind. Her joints slow her down but I think her back legs are getting stronger. Tillie, I am already in love with you. I just finished my application and I hope that soon I will be able to have you live with me. I am interested in rescueing a pug. I have a mini schnauzer, a fat cat, and a 4 yr. old son (single dad). My son wasn’t a rescue, but I could use it from time to time. I have never owned a pug, but I have known several throughout my life. They have more character than any dog I have ever been around. Everything is peaceful in the house most of the time. I have a 3 bedroom house and a big fenced in back yard (new fence). I have the room, patience, and love to really enjoy a pug. I think Tillie, Margie or maybe another would fit in well. I live in Knoxville, Ia. near Des Moines, and can come to Omaha at your conveniece. Thanks for the consideration.